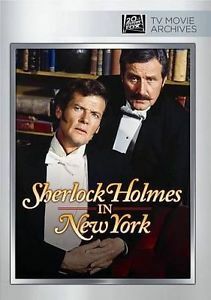 Sherlock Holmes in New York is a 1976 American made-for-television mystery film about Sherlock Holmes and Doctor Watson, played by Roger Moore and Patrick Macnee respectively. Despite the film's title the production was shot entirely in Southern California at the 20th Century-Fox lot in West Los Angeles, with some scenes filmed at the Mayfair Music Hall in Santa Monica. During their investigation, Holmes and Watson are reunited with their old acquaintance Irene Adler, now a popular music-hall singer, who reveals that Moriarty has kidnapped her son. Moriarty has also left a note for Holmes informing him that he will be approached by the police soon for aid in a crime, and should he not refuse – Moriarty also informing him that he should provide no reason for his refusal – the boy will die. Holmes is subsequently contacted by the NYPD regarding the recent apparent theft of the international gold exchange at the New York bank, with the entire vault of gold bars having vanished seemingly overnight, the theft only secret until a planned transaction between Italy and Germany in three days' time. To protect the child, Holmes refuses the case, but a chance comment by Watson inspires Holmes to shift his attention to finding Scott to remove the blackmail card. While Watson departs with Irene disguised as Holmes to draw away the agent Moriarty has assigned to watch him, Holmes determines that Scott was tricked into cooperating with the kidnapping as an apparent joke, allowing him to find the kidnapper. Investigating the vaults, and quickly ruling as impossible the actual removal of many tonnes of gold via a narrow tunnel in the time available, Holmes swiftly determines what has taken place; based on the speed of the lift's descent, it should take them 45 seconds to reach the vaults, but they stopped after only 42 seconds. From this, Holmes deduces that Moriarty had an empty, duplicate vault built a few meters above the real one, subsequently planting iron bars to stop the lift reaching the real vault. While everyone puzzled over how the bars of gold were stolen from the false vault, Moriarty would actually be stealing them from the real one below. In a final confrontation in New York's underground, Moriarty escapes. When initially approached to portray Sherlock Holmes, Roger Moore was uninterested. After reading the script he decided to go ahead having found it "funny and original." He was attracted to how different the role was than other projects with which he had been involved. But what I most like about playing Holmes is that there is more dialogue then I ever had in 120 Saint episodes and two Bond films. Casting John Huston as Moriarty allowed for an homage to his classic film, The Maltese Falcon by having a reproduction of the film's jeweled Falcon on Moriarty's desk. Patrick Macnee was cast as Dr Watson and played him in the same bumbling fashion as Nigel Bruce had decades earlier. Macnee went on to play a more intelligent representation of the character in two television films opposite Christopher Lee as Holmes, Sherlock Holmes and the Leading Lady and Incident at Victoria Falls. The film was scored by Richard Rodney Bennett, marking his first work for American television; Leonard Rosenman conducted. On October 9, 2006, Intrada Records released the music on a limited edition CD alongside Georges Delerue's score for The Pick-up Artist. On August 22, 2014, the film was released as a manufactured on demand DVD by 20th Century-Fox Cinema Archives. ^ a b c d Haining, Peter (1994). The Television Sherlock Holmes. Virgin Books. pp. 73–74. ISBN 0-86369-793-3. ^ Bunson, Matthew (1997). Encyclopedia Sherlockiana. Simon & Schuster. p. 236. ISBN 0-02-861679-0. ^ a b Barnes, Alan (2011). Sherlock Holmes on Screen. Titan Books. pp. 222–224. ISBN 9780857687760.